We at PRA are excited to unveil imagery of our most recently completed project, an office-laboratory fit-out in Watertown, MA. Learn more about this exciting project here! PRA has been working with a local biotechnology company to fit-out a 14,450 SF newly-leased space on a highly-accelerated schedule to become the firm's operations, research and development hub this Fall. The project includes state-of-the-art office and meeting spaces, industry-leading process/engineering, coating and analytical laboratory facilities, and safe and secure hazardous chemical storage areas. Along with a carefully cultivated modern design including all new interior finishes, fixtures and equipment, additional HVAC systems have been engineered by RDK Engineers to meet the rigorous requirements of the R&D program. With construction already underway, we look forward to completion later this year! 40 Bow Street wins Cambridge Preservation Award! We are proud to announce that our recently completed project, 40 Bow Street, has been selected by the Cambridge Historical Commission as a 2016/17 Preservation Award winner! This award, given to a select few projects each year, is recognition for a building's role in conserving and protecting the historic character and architecture of the City of Cambridge, MA, All of us at PRA Architects are honored to have our work recognized for this very important accomplishment and pleased to have received our fourth such award from the Cambridge Historical Commission. Click here to head over to the full project page and learn more about this historic restoration project. Construction begins on the Activities Room Addition at Bethany Health Care Center! In support of the mission of the Sisters of St. Joseph, and together with Colantonio as general contractor, we are excited to begin construction on this exciting project! This site features a new, fully-responsive layout, large-format imagery, and a freshly curated selection of our work, staff, and office culture. We hope you like what you see. We'll be continually updating the site with new information, so keep coming back to learn what we're up to, and be sure to follow us on Facebook, Twitter, and Pinterest for the latest updates! Keep up with PRA on Twitter, Pinterest, and Facebook! Follow us on any of these platforms to stay up to speed on our current work and goings-on here at PRA. Roger's Pub & Grille has officially re-opened its doors after after being completed on time and under budget. 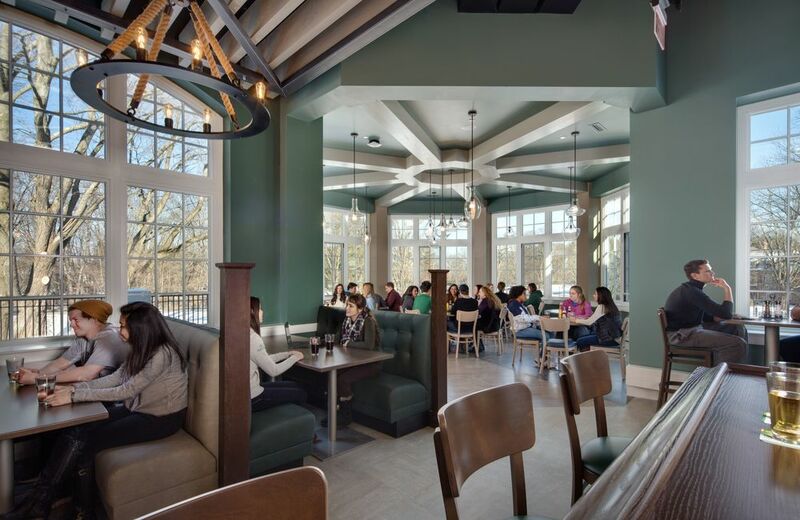 The project moved the previous iteration of Roger's Pub from Park Manor Central-- currently undergoing full renovation-- to its new location attached to Trim Dining Hall near the campus' prominent gateway along Babson College Drive. 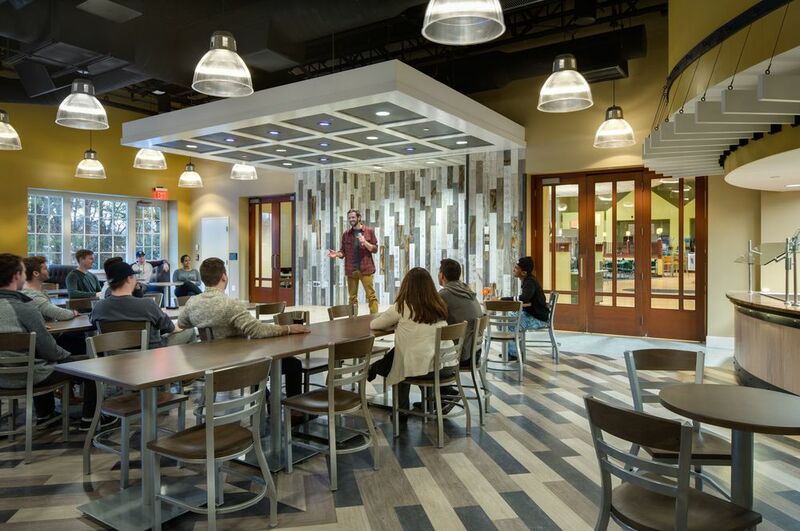 The new pub features a large, flexible event space with a stage connected to the existing dining hall, while supporting main dining hall operations with overflow seating space during daytime weekday meals. Read the full article in the Babson News by Brianna DiPietro by clicking here. To read the Babson Magazine feature, including a slideshow with additional images, click here. To learn more about the project, view our project page by clicking here. A lot has happened around here since 1991! We will be celebrating our milestone with a reflection on our past, the places we've worked, and the relationships we've made along the way. Check back here periodically for our forthcoming 25 Years retrospective series! After finishing its final review of the project team's submitted Leadership in Energy and Environmental Design (LEED) documentation, the United States Green Building Council (USGBC) has certified that North Hall has achieved the rating of LEED Gold, the second-highest rating possible under LEED certification standards. To learn more about North Hall's sustainability features, you can read our feature-length description by clicking here. Read the story from at Boston.com by Jaclyn Reiss clicking here.